A green eyed mexican wolf, quietly padded through the lands of the mountain. Hot air would escape his mouth creating a small fog like formation. Every step the brute took, would make small crunching sounds beneath his pads. The white ground would shrink under him, because of his weight. Climbing higher and higher, he suddenly came to a stop, his emerald orbs spotted somewhat of a den below him. " Where am I?" murmured Kendrick, all he could remember was running away from his father and then he suddenly ended up here. " Nice going Kendrick" he said quietly to himself, the brute had gotten himself lost, and now he will have to find some way to survive on his own. He lifted his nose in the air, giving a big sniff, the brute was trying to find any scent that was nearby. Siren lifted his maw in a deep snarl, his nape prickling as the scent of a stranger wafted into his nose. Who could venture here? Surely there wasn't another soul atop this mountain! The brute let his receptors flatten to his skull, and his chartruese gaze sought out the captor. Whom would wander to the Koti Den? Could they not smell the thick, doggish odor that lingered here? With another throaty snarl, Siren let his paws step carefully over the rocks. "Who goes there?!" He called, hatred whisked in his voice. Perhaps it was the dreaded Mountain Lion? Sharon quietly walked into the area. She scented another Mexican wolf close by. She looked around, and saw the male, few yards away. She wanted to stay hidden, but she wouldn't be able to survive long in this strange place. She held her growling stomach, and her aching legs, and went up to the wolf. "Hello?" she said. "My name is Sharon, do you know where we are?" she asked hoping to get some information from him. She walked closer. Suddenly, she heard another wolf, demanding. She quickly stopped, to see their reaction. She bowed, to show no offense. Lowering his nose to its normal position, Ken lobes flicked to a she wolf behind him. "Hello?" "My name is Sharon, do you know where we are?" he heard the femme say. He rotated around to get a better look at her, she had a white amberish coat, and blue amber eyes. He cleared his throat and hesitated for a minute before responding," Hi Sharon, I'm Kendrick um sorry but no I don't know where were at." Hearing a snarl near them, Ken lobes flatten over his head, and he tucked his tassels under his back limbs. "Who goes there?!" said the booming voice. Going in submission mode he twirled around showing the wolf he was no threat," Um uh I'm sorry for intruding in your territory... sir. I go by the name Kendrick." He glanced at the she wolf beside him," ..and the white wolf beside me is known as Sharon." 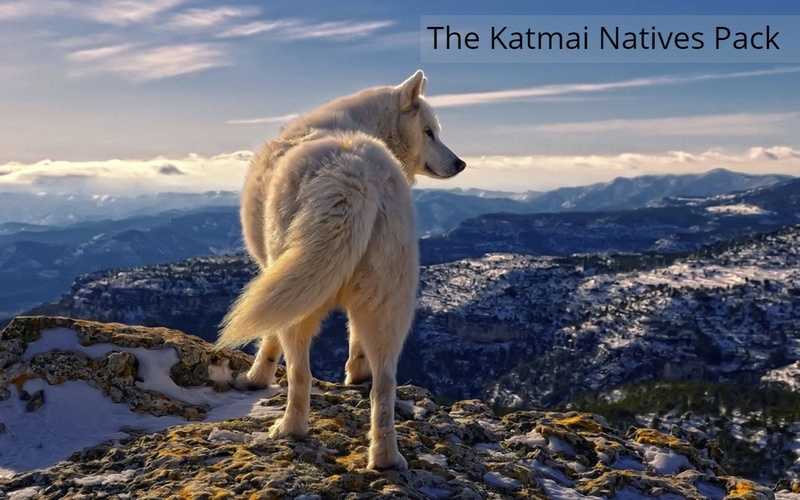 The canine then narrowed his emerald gaze, watching both of the wolves. They look almost vulnerable, no threat to him, so Siren let his silver banner of a tail lower normally. Now, he unhinged his jowl in order to speak to the duo. "Very well..." he began, his voice still hoarse. "I suggest you're here to join the pack?" Carefully, the Doyen stepped closer, letting a cloud of breath emit from his nostrils. Macy perked her ears the the smell of new comers. It seemed Siren was already conversing with them, but she walked over there just to be sure. "Hello there," she spoke in a sweet tone, "welcome to our land." The female knew already Siren had asked them if they wanted to join, so there was no point in adding that into what she was saying. Her tail swayed gently behind her feeling the cold breeze on her pelt. Kendrick glanced at the femme named Sharon again, then back at the male. “ He must be an Alpha” thought Ken, his emerald pools still gazing at the brute. He bowed his head to the male and kindly said,” Yes please if it isn’t a bother to you..sir” Kendrick head still lowered waited for the males reply, he awkwardly stared at the surroundings near him. 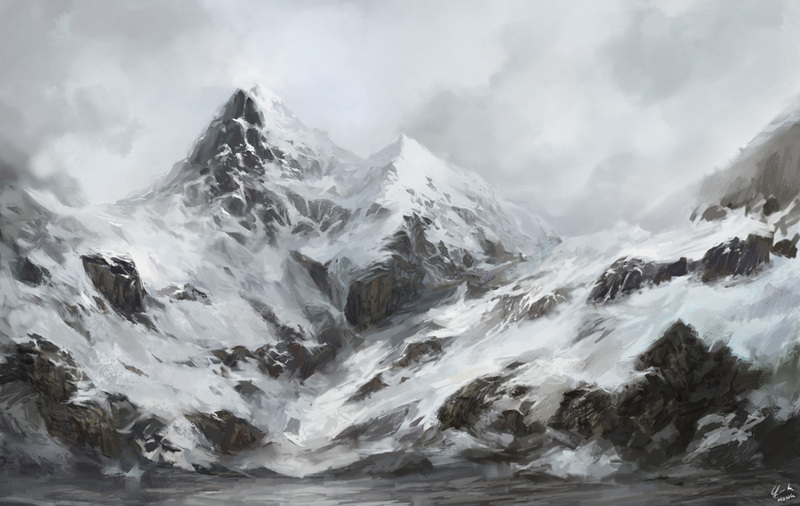 Nothing but a plain snow covered mountain with rocks,” I wonder how many wolves are around here?” he questioned silently to himself. Hearing another voice but a more feminine one like Sharon's, he looked up and saw a fae. Sharon gulped. "Ok, thanks..." she said to the male wolf, Kendrick. Turning towards the the other male, she assumed the alpha, she replied agreeing with Kendrick, "Yes, like Kendrick said, I'm Sharon and I certainly did not mean to intrude, perhaps your territory." Looking back at Kendrick, she added "It would be great if I could...could join the pack, and you know, help out, I do have some what great knowledge of herbs and plants..." She sat down next to Kendrick and waited for the alpha's reply when she suddenly heard another female's greeting voice. "Hello, I'm Sharon." Thinking she must be the alphaess, she waited for their reaction. Macy nodded gently at the new members feeling as if they were safe. "What has brought you here?" She tilted her head as she asked in a calm voice. "Oh, I'm sorry. Nice to meet you Sharon, I'm Macy." The Doyen let out a small chuckle but returned to normal as she awaited an answer. Sharon turned towards the alphaess, "Nice to meet you Macy. Well, I have been wandering around these areas, I was kind of lost. I saw too many risks, so I thought it would be a good idea to stick with a pack." she explained. "I think this pack will be a great one." she smiled and looked around to see any more wolves. Macy nodded ad the female, then spoke once more. "Well I would be happy to accept you, welcome to the pack Sharon." Her ears flickered gently and she stood up slowly to walk around the territory some more. It was not snowing, yet there was still snow on the ground from yesterday. Her legs lifted high as she easily walked through the virgin snow. Sharon was happy and relieved at the same time when she heard that Macy would want to accept her. "Well, thank you Macy, I'll try my best to serve the pack the best I can." Sharon decided to catch a little something before she did anything, her stomach was begging her. Dash, this area is for RP only. Please keep comments to the chatbox and elsewhere. Thanks. Kendrick glanced at Sharon, a small smile formed on his maw. He then changed his view to the fae in front of them, he bowed his head and said," Hello I'm Kendrick, I somewhat have the same story as Sharon, but instead of wandering I was more um... escaping from someone." He looked down towards his paw, as to notify the she wolf that he didn't want to speak of the person who he was escaping from. Lifting his gaze back up he quietly watch the she wolf Macy wander off around the territory, then he looked at the Alpha. Observing the male for a while Ken noticed that the male seemed to have the same eye color as his but the male's eye seemed to glow. The male purred doggishly as his fellow Doyen arrived beside him. After a firm nodding of his frame, he settled his gaze upon the Mexican Wolf. Siren noticed the brute's staring, so he said dryly, "These eyes mar that I was born and raised within these mountains. And by the looks of yours, you aren't from here, are you?" Siren flicked his gray receptors towards Kendrick. Seeing the male glance at him, Kendrick snapped away from the males gaze, and looked uncomfortably towards his pads. Ken's lobes flicked to the words of the brute,"These eyes mar that I was born and raised within these mountains. And by the looks of yours, you aren't from here, are you?" Kenny cautiously nod his head," No..sir.. I'm not from here, I was born so-omewhere else." Ken slightly glanced at the male then they quickly looked back down at the ground, his lobes flattened on his head. A small, tinged chortle erupted from the character's throat as he watched the canid's submissive actions. Siren stepped closer, his dulled claws tapping at the frozen rock beneath them, and lowered his head towards Kendrick. "Very well. If its a pack you seek, then I grant you permission to join." Siren touched his nose to the wolf's forehead, as he did when he welcomed a new member, and stepped back. "I can assure you that life in the mountain isn't a walk in the park, however." Noticing the male coming closer, Kenny frozed waiting for the moment the brute might clasp his jaws around his neck. Kendrick closed his eyes, waiting for the terrifying moment when the male ends his life. Instead of feeling sharp fangs wrap around his neck he felt a light touch of the brute's nose on his forehead. "Very well. If its a pack you seek, then I grant you permission to join." Ken heard the male say. When the male stepped back, Kendrick stared at the male, he weakly smiled and said," Thank you for accepting me into your pack, sir!" Hearing the last words, Ken lips formed a smirk and the mexican wolf barked," Eh I like a challenge, if its for the pack I will willingly give up my life for the wolves who accepted me." Kendrick shrank his forelegs to the ground and proudly bowed to the male in front of him, his tail sticking up behind him. Lifting himself back to his normal stance he gave the male a confused look," Forgive me for asking but.. What is your name, sir?" With a voice as strong as a kind the male unhinged his jowl for a hasty second. "Siren." The male turned his back towards the newcomer and began to saunter slowly towards the den area. He wasted no time with rendering any words, for her was not one to let poetic verses drip from his tongue. He turned again, his pelt rippling as his should blades buckled under his hide, and repeated. "The name's Siren." Kendrick emerald orbs quietly observed the grey male. "Siren" Ken repeated quietly in his head. Kendrick briefly nodded to the male," Nice to meet you, Siren." The mexican wolf continued to watch the male turn away from him. Suddenly a question popped into his head and he quickly said," Is it okay if I traveled around the territory for a while? S-so I can get a better feel of the land." Just as the brute began to settle pack into his gnarled bed of stone, another question pricked him in the flank. Clearing his throat quietly, the Siren lifted his head again. "Go ahead. Though, watch out for the predators. There's a lot of them here." The wolf then plopped himself down, and then added, "You know, if you enjoy exploring or keeping watch you should be interested in the Wache or Saimoor." Kendrick's lobes perked up when he heard the okay sign from the Alpha. Ken twirled around heading to the direction that could lead him somewhere else. But then he heard what the Alpha said, he quickly rotated around and padded over to the male. Stopping a few feets from the lying male he said," What's a Wache and a Saimoor?" Noticing he was asking quite a bit of questions he growled quietly to himself and lowered his head respectedly to the Alpha Male," Sorry for asking so many questions.."
Siren flicked his ears again to the newcomer, blinking at him. "Well, Waches go out and watch the pack's surroundings to make sure everything's going okay. Seimoors are members of the pack who go out and explore new lands around Katmai, and sometimes their work is dangerous." He nodded again to the tawny brute.